If you’re a regular player at an online casino, then you are probably already aware of the role the different software providers play. If that’s the case, and you’re here because you’re looking for a casino that offers a particular software, then below you’ll find a series of casino lists split by software. For those of you unfamiliar with the concept, here’s how it works. Most online casinos don’t make their own games, instead they license them from specialist producers. There are many reasons for this, but the main one is probably because it allows the casinos to offer a much larger range of games than if they were producing them themselves. It also allows for some interesting licensing deals which means you’ll see branded slots featuring Marvel Charactors, film stars, TV shows, computer games and pretty much anything else that offers merchandising. The software compaies pay big bucks to be able to incorporate these charactors and features into their games, something which wouldn’t be feasible for a one-man band to do on a large scale. And then there’s the jackpots… In order to get big jackpots you need a lot of people playing them. Most of the larger jackpots are pooled between all casinos that offer the game – with a contribution made to the same collective jackpot prize fund each time you play, regardless of where it is you’re playing. Some casinos will only offer games from one software company, but that concept is becoming less and less common these days and most integrate a range of different software. This sometimes makes it tricky for a player to know which company has made the game you’re playing – especially if you like it and want to play it at other casinos. So, how do you tell? Most games will have the logo of the games manufacturer on the loading screen. 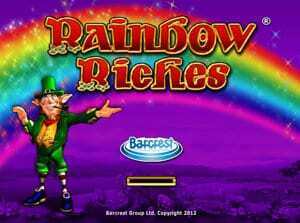 For example, for the slot Rainbow Riches you can see that the game is made by Barcrest – showing both their logo and copyright infomation. Other places to look include the paytable or the info/help screen for the game. It may not always be immediately obvious, but you’ll almost always be able to find the providers name within the game itself. Then to find other casinos that offer it, simply check our list for that software company. The online casino industry moves quickly, and if a software doesn’t keep up then there’s a strong chance it wont last very long. That’s not to say there was anything neccesarily wrong with the companies or their games, just that they weren’t able to compete and chose (or were forced) to stop operating. And sadly this often means saying goodbye to much loved games. In this next section we’ll provide a bit more detail about the software that are no longer around. So if you were wondering ‘what happened to…’, hopefully this should help shed some light. VueTec were a live casino games company who served a number of online casinos with live dealers broadcast from the Fitzwilliam Card Club Casino in Dublin. Casinos using the games included Dublin Bet and Lucky Live Casino, both of whom still exist, but who use different providers. The company ceased to operate in 2015 and not much information was given about the reasons behind the closure, or has been discovered since. Grand Virtual was a unique software group who closed their virtual doors for the last time in 2013, taking popular games such as Cactus Jack and Goooaal! offline. The software has been around since 1997 and started operating under a new name in 2005 – Cambridge Interactive Development Corporation (CIDC). Of course everybody (including us) ignored that change and continued to call it Grand Virtual. Only a small handfull of casinos used the software, all of which were managed under the Everest umbrella: Everest Casino, Imperial Casino, Casino Treasure, Casino Lux, Casino Glamour, Casino Fantasy and Casino Elegance. Since the closure, two of the primary GV brands have switched to using Playtech casino software whilst the remaing 5 have been shut down and their players transferred across to Imperial Casino. The group also operated an independent poker network called the Everest poker Network which has also shut down. The networks only room (Everest Poker) is still in operation but has moved its players to the iPoker network. Various reasons for the closures have been cited – including financial difficulties, a takeover of the group by Betclic (who also own Expekt) and dwindling players numbers. Put all of these factors together and you get the simple conclusion that there weren’t enough players to justify operating a unique software brand.